Six months after an 18 month governmentless-deadlock that ended after all the parties were whisked off to Qatar, lots of money exchanged hands, and the head of the Army was appointed president, Lebanon's many factions have finally agreed on a cabinet. The 30 member body is led by [Sunni] Saad Hariri, son of the slain and far more charismatic Rafiq Hariri. There is a Shiite Foreign Minister, a Greek Orthodox Defense Minister, and a Hezbollah Agriculture Minister. Each seat was designated for a certain party, with no apparent regard for the qualifications particular individuals might bring to the posts. Among the 30 member cabinet are 6 Sunnis, 6 Maronite Christians, 5 Shiites, 4 Orthodox Christians, 3 Druze, 1 Catholic, 1 Protestant, and 1 Armenian Orthodox. For those of us who love but never make tabbouli because it is so darned labor intensive, the idea of making 3 1/2 tons by hand is just way, way over the top. Tom and I walked downtown to witness the breaking of the Guinness world record for largest tabbouli in the world. Apparently it took "250 sous-chefs and their 50 bosses from a private culinary school" all day to chop all that parsley and mint. Ouch, and onions. And the bowl itself was something of an engineering feat. However we missed the previous day's offering of a two-ton serving of hummus. We can't form a government (now four months after elections) but at least we can unite to make stupendous food. Tom and I helped out at the ACS Halloween carnival, the main fund raiser for the school. 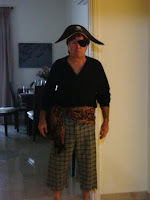 He wore many hats, notably this pirate one, to work in a game booth featuring a treasure chest. I wish you could see the pony tail in the back--very cute. Then he went to the dunk tank. And had just a few minutes to dry off before joining in an elementary school folk dance ensemble (no photo, sorry).